Figure 7.13 The Structure of Transfer RNA (tRNA) The anticodon of the tRNA base-pairs with a specific codon in the mRNA; by doing so, the appropriate amino acid is delivered to the site.The amino acid that the tRNA carries is dictated by the genetic code.The tRNA that recognizes the codon GAC carries the amino acid aspartate. In prokaryotes, translation begins as the mRNA is still being synthesized (figure 7.14). The 30S subunit of the ribosome binds to a sequence in mRNA called the ribosome-binding site. The first time the codon for methionine (AUG) appears after that site, translation generally starts. That first AUG is typically 7 nucleotides downstream of the ribosome-binding site. Note that AUG functions as a start codon only when preceded by a ribosome-binding site; at other sites, it simply encodes methionine. The position of the first AUG is critical, as it determines the reading frame used for translation of the remainder of that protein. subunit of the ribosome joins that complex and the initiation factors leave, forming the 70S ribosome. The elongation phase then begins. 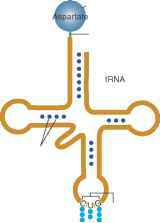 The 70S ribosome has two sites to which tRNA-carrying amino acids can bind (figure 7.15). One is called the P-site (peptidyl site), and the other is called the A-site (aminoacyl site, commonly referred to as the acceptor site). The initiating tRNA, carrying the f-Met, binds to the P-site. A tRNA that recognizes the next codon on the mRNA then fills the unoccupied A-site. An enzyme joins the f-Met carried by the tRNA in the P-site to the amino acid carried by the tRNA that just entered the A-site. This transfers the amino acid from the initiating tRNA to the amino acid carried by the incoming tRNA. The ribosome advances, or translocates, a distance of one codon, and the tRNA that carried the f-Met is released through an adjacent site called the E-site (exit site). Translocation requires several different proteins, called elongation factors. As a result of translocation the remaining tRNA, which now carries the two-amino-acid chain, occupies the P-site; the A-site is transiently vacant. A tRNA that recognizes the next codon then quickly fills the empty A-site, and the process repeats. Once translation has progressed far enough for the ribo-some to clear the ribosome-binding site and the first AUG, another ribosome can bind to begin another round of synthesis of the encoded polypeptide. Thus, at any one time, multiple ribosomes can be translating a single mRNA molecule. This allows the maximal expression of protein from a single mRNA template. The assembly of multiple ribosomes attached to a single mRNA molecule is called a polyribosome or a polysome. Elongation of the polypeptide terminates when the ribosome reaches a stop codon, a codon that does not code for an amino acid and is not recognized by a tRNA. At this point, enzymes called release factors free the newly synthesized polypeptide by breaking the covalent bond that joins it to the tRNA. The ribosome falls off the mRNA and dissociates into its two component subunits, 30S and 50S. These can then be reused to initiate translation at other sites.